Island Hopping at Fun & Sun Dive & Travel for Bagonbanwa or South Sandbar Island. The sandbar is located a little bit more than an hour away South of Mactan Island. 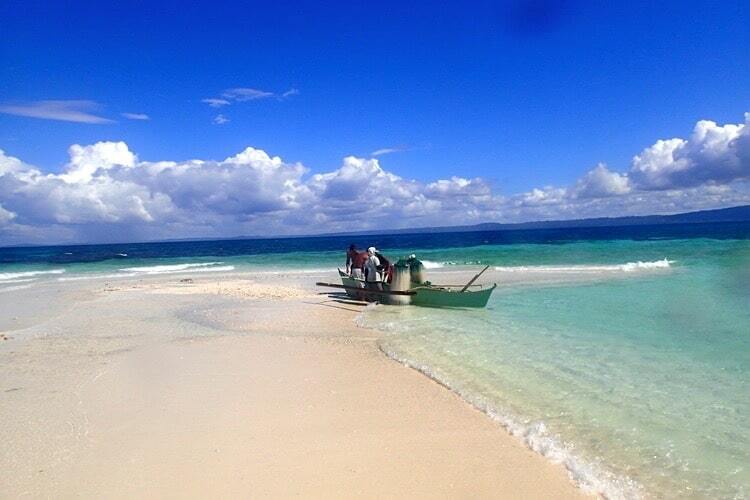 Fun & Sun will bring you to this enchanting and pristine sandbar on board of one of its bangkas. Also known as Bagonbanwa by local boatmen and fisherfolk, the South Sandbar is considered a mystery since it rises right in the middle of the ocean during the low tide. Worship the sun along the soft white sand. Take pictures of the different flocks of seabirds. Admire the simplistic beauty of marine life as you dive into the deep blue. After each visit, tourists are left in awe and delight in this small slice of paradise. The South Sandbar is a hidden gem among the beautiful islands of Cebu. Each visitor would feel during their visit like having an entire ocean to themselves. During the high tide, the sandbar completely disappears. With the beautiful coral reefs within the area, this also makes Bangonbanwa a good spot for snorkeling with friends or family. Get your underwater gear and sunblock ready and discover the South Sandbar today! Don’t forget to try our delicious BBQ!